Liberals sued President Trump in what is now known as the Travel Ban case. The substance of the liberal allegations was that the underlying purpose of Trump's "Travel Ban" was Islamic animus - that the President’s stated concerns about vetting protocols and national security were, in fact, just a guise for discriminating against Muslims. At the heart of the liberal case were a series of statements made by Trump and some of his Twitter retweets. Statements like “Islam hates us," and we need a "total and complete shutdown of Muslims entering the United States until our country’s representatives can figure out what is going on," and retweets of links to three "anti-Muslim propaganda videos." And, five out of the seven banned nations have Muslim-majority populations, the liberals cried out. 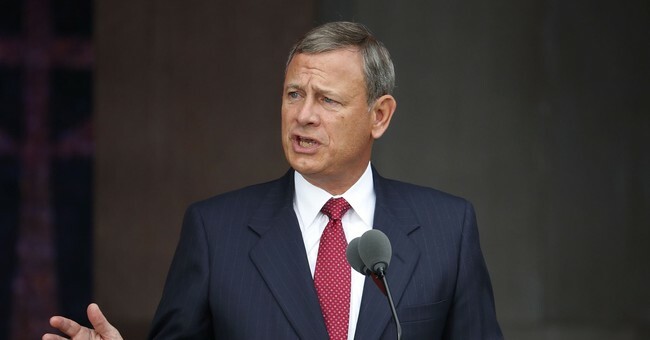 But Chief Justice Roberts, writing for the Supreme Court, referred to these statements and retweets as "extrinsic evidence" and stated that the President's "policy will be upheld so long as it can reasonably be understood to result from a justification independent of unconstitutional grounds." The banned nations make up only 8% of the world's Muslim population, and the ban is limited to countries that were previously designated by Congress or prior administrations as posing national security risks, the Court observed. More importantly, the text of the ban says nothing about religion, and Justice Roberts did not see fit to read random statements on religion from the campaign and from Twitter into the ban. The Supreme Court instead concentrated on the authority of the Presidency itself and on the 8 U. S. C. §1182(f) law giving a president power to create a travel ban. Quite simply, under U.S. law, the President may limit alien entry when he finds that their entry “would be detrimental to the interests of the United States.” 8 U. S. C. §1182(f). In this case, Trump determined that aliens from some countries are detrimental because those countries do not share adequate information with the U.S. for an informed decision on entry, and that other countries are detrimental because their aliens create national security risks. Trump explained that the limits he put in place were tailored to protect American interests. The only prerequisite set forth in §1182(f) is that the President "find" that the entry of the covered aliens would be detrimental to the interests of the U.S. "The President has undoubtedly fulfilled that requirement here," the Supreme Court ruled. He was squarely within his powers. And as for the liberal cries of outrage and disgust? The Court shut them down. “Whether the President’s chosen method of addressing perceived risks is justified from a policy perspective is irrelevant to the scope of his [§1182(f)] authority." Then the Court cited prior travel bans, including Obama's, which also banned travel, to show congruity, to show the liberals that Obama and Trump's travel bans are ... similar. More fundamentally, plaintiffs and the dissent challenge the entry suspension based on their perception of its effectiveness and wisdom. They suggest that the policy is overbroad and does little to serve national security interests. But we cannot substitute our own assessment for the Executive’s predictive judgments on such matters, all of which are delicate, complex, and involve large elements of prophecy. Justice Roberts got it right. "So much winning!"